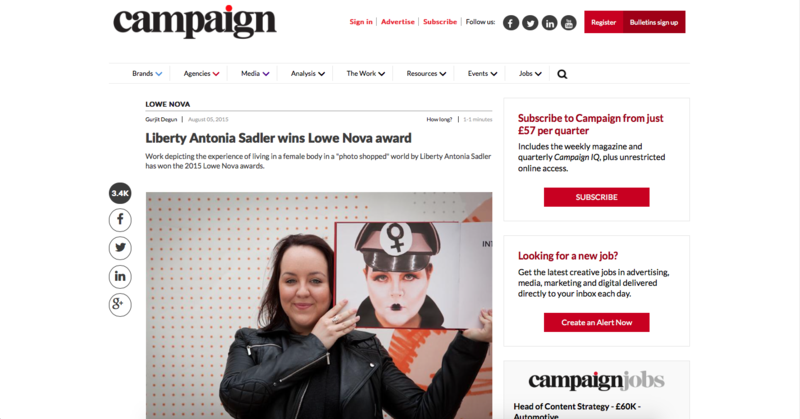 Work depicting the experience of living in a female body in a "photo shopped" world by Liberty Antonia Sadler has won the 2015 Lowe Nova awards. Sadler picked up the accolade during a ceremony in London today. The awards programme was created five years ago through a partnership between Mullen Lowe and Central Saint Martins, an art and design school. Sadler’s work "uses character and playfulness to discuss themes of food, femininity and sexuality". Jose Miguel Sokoloff, the president for the Mullen Lowe Group Global Creative Council, said: "We see these awards as an investment in emerging creative talent, where our support and encouragement can help provide a platform for these individuals to go on and influence the rest of the world." WHAT CAN WE LEARN FROM THE LOWE NOVA AWARDS THIS YEAR? It’s a wrap. With the 2015 Degree Show at Central Saint Martins now a (fantastic) memory the winner of the Lowe Nova Award has been announced. The award was set up in 2011 in partnership with Central Saint Martins and it represents a brilliant platform for emerging talent. First and foremost the quality and skill of the artists’ work on display was exceptional. The very talented Liberty Antonia Sadler took the top gong for her satirical piece of ‘fine art comedy’ that explores female stereotypes combining animation and performance. There were two common threads that had the biggest impact on me personally and that I’ll be able to draw from in my own work as Head of Design. Firstly the innate optimism that inspired the student’s work, and secondly the unexpected angle often adopted to address their chosen subjects. The students’ approach was refreshingly optimistic, even when addressing much more deep-seated social, political and personal issue. Words by Silvia Sella, Head of Design.